Coaching Skills for Healthcare l Coaching Out of the Box® has gone viral! Healthcare organizations and their leaders are being challenged like never before. As a result, they are suffering from a host of issues that are impacting everything from employee satisfaction and turnover to the bottom line. In the face of these challenges, many are turning to coaching for help and it is catching on. Results. Healthcare organizations that have implemented a coaching culture are seeing results in improved employee engagement, communication effectiveness and improvements to the bottom line. The results of our work in healthcare have been so transformational we were invited to present at the Institute of Coaching, Harvard Medical School & McLean Hospital. The new work environment requires new leadership skills. There has been a tremendous shift from routine, repetitive measurable work, to work that involves critical thinking, analysis and creativity. The old carrot and stick approach to leadership no longer works and can even have devastating results in today's organization. Coaching brings about a shift in perspective and gives leaders new tools that are solutions based and better suited to today’s work and work environment. Adaptability and sustainability. The new work environment requires a way to lead that will produce positive and sustainable results; a leadership approach that is continuously adaptable to internal and external change. Coaching is more than a skill, it is a new way of thinking and a new way to approach leadership. This new coach approach to leadership can be integrated throughout the organization and sustained for long-lasting positive change. Leaders in Coaching. Specialists in Healthcare. Coaching Out of the Box® is a leader in teaching individuals and organizations to leverage the incredible power of coaching. To date our flagship 5/5/5 Coaching Skills Training Program™ has been delivered to over 18,000 people in 38 countries. While we work in all industries, we have a specialization in healthcare. Over 7000 healthcare leaders, managers, clinicians, employees, and teams have learned our easily adoptable 5/5/5 Coaching Skills Training Program™. When Covenant Health was looking to implement a coach training program, the overarching goal was to ensure we were working toward creating a coaching culture within the organization. Coaching out of the Box was chosen as the program used to facilitate the development of a coaching culture as it is a proven, evidence-based program providing practical learning offerings that result in tangible outcomes for the learner. We wanted participants to be able to experience coaching firsthand and discover for themselves the impact it could have in their lives both personally and professionally. Since implementing the program, we have noted our leaders are much more likely to ask questions rather than tell when a problem presents itself. Leaders listen more deeply and ask better questions. That learning translates in the way we care for each other as employees, but also in the way we care for our patients, residents and families. Training solutions for both individualsand organizations. Results presented to Institute of Coaching, Harvard Medical School & McLean Hospital. 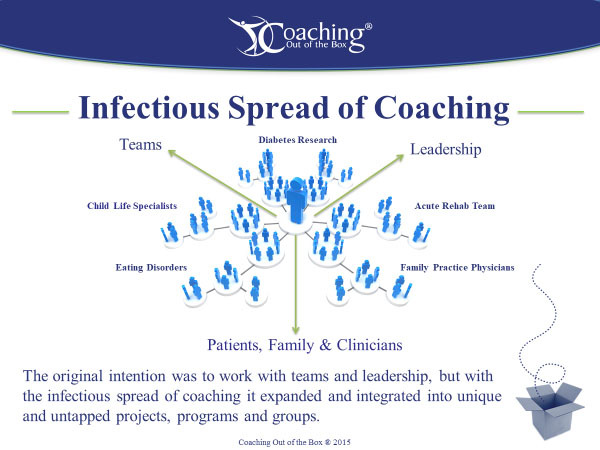 Coaching Out of the Box® is ready to help you and your healthcare organization. Contact us today to learn how to get started!